The Maoist era marks one of the darkest hours of the Church’s history in China, and Chinese Catholics are begging to let the world know about the sacrifices of holy men and women to retain their faith. China’s Catholic response to its new government was simple: resistance. The historical pattern for Catholics in China after Chairman Mao Zedong (1893-1976) became the “Great Helmsman” was straightforward; Communist persecution and Catholic resistance produced decades of suffering and martyrdom. Several years ago, during a visit to Guiyang’s magnificent cathedral, I met with Bishop Wang Chongyi (b. 1919). After sitting down beside him he told everyone to leave and close the door, and then he leaned over to whisper in my ear: “I was in prison during the Maoist era; I watched my fellow Catholics suffer. No one will ever know how many people were tortured and killed. I saw it. They were saints.” He asked me to tell their stories, and in this third installment of my series on Catholic martyrdom, “From Mao to Now” (Part One; Part Two), I will fulfill my promise to address Catholic suffering during the rule of Chairman Mao, from 1949 to 1976. In Church Militant: Bishop Kung and Catholic Resistance in Communist Shanghai, his inspiring study of Catholic resistance in Shanghai, Father Paul Mariani, SJ, recounts the Party’s early strategies for confronting the presence of religion in China. Anti-Christian militants in the new, Communist China, “were not above using antireligion campaigns and terror…everything from burning churches to killing religious leaders.”  In one early Communist document related to the “religious problem” in China, it is affirmed: “Marxists are absolute atheists. We believe that religion is an impediment to the people’s awakening.” What followed this assertion of the Party’s anti-Christian position was a sustained newspaper and poster crusade of slander and harassment against the Church. While researching for a new book, I spent some time at the Shanghai Municipal Library thumbing through copies of 1951 newspapers, and I discovered that anti-Catholic articles and cartoons were a national priority for Mao’s new regime. In one article, Catholic nuns were villainized as “baby killers”; in another, Catholics were accused of secret plots to overthrow the “People’s Government” while full-page features highlighted vitriolic cartoons depicting Catholics as “unpatriotic” and “imperialist agents.” In one cartoon, which appeared in the Jiefang ribao, 解放日報 or “Liberation Daily,” a European bishop is depicted with a banner of the Virgin Mary above the American and Korean armies, then considered the enemies of the Chinese people. The side caption reads: “The people resist America and support Korea’s patriotic movement—as they [Catholics] assert: ‘The Holy Mother watches above the American and Korean militaries.’”  Turning Catholic images and actions into iconic “enemies of the people” was common; in that cartoon, Mary, the Mother of God, is shown as the protectress of China’s rivals. In another cartoon, a Chinese priest, mistakenly depicted with the pectoral cross of a bishop, is shown being beaten out of a Catholic church by a massive fist with the words, “Patriotic Catholic,” 愛國天主教友 inscribed on his arm. He is accused of being a collaborator with “imperialist powers,” and his priestly habit is adorned with Nazi swastikas. Such articles and cartoons were the first stage in a calculated operation to summon the people against Catholics, and these efforts were largely successful. Soon after their publication in the early 1950s, massive rallies of Socialist Youth marched through city streets with anti-Christian banners calling the government to suppress Catholic groups such as the Legion of Mary. Prior to the peak era of Catholic martyrdom during the 1960s, the Party initiated a wide-scale arrest of Catholic clergy and hierarchy; as St. Mark wrote in his gospel, “I will strike the shepherd and the sheep shall be scattered.”  On September 9, 1955, Shanghai’s police were dispatched to raid and arrest priests and faithful at all the city’s Catholic parishes, schools, convents, and other Church-related properties. “They arrested Bishop Gong,” writes Msgr. Stephen DiGiovanni, “a number of priests and hundreds of lay Catholics.” Immediately after the wave of arrests, the Catholic newspaper overseen—and controlled—by the local government, The Courier Dove, announced that Bishop Gong was detained for spreading “anti-revolutionary rumors with evil intent; sheltering anti-revolutionary elements in the cathedral and other places,” and for “praying to God for Catholics who had been condemned by the Communists.” Any Catholic who had not denounced his loyalties to the pope, and who had not made his intentions clear to place the Party above his religion, was targeted as un-Chinese, counterrevolutionary, and unpatriotic. Bishop Gong and all other priests, nuns, and lay Catholics who did not follow this line were accused of undermining the people’s revolution under a subversive “cloak of religion.” Bishop Gong remained in prison for more than three decades; he was offered release if he denounced the pope, though he never did. Bishop Wang Chongyi and many other Chinese Catholics have suggested that the most intense era of Catholic persecution and martyrdom was during the 10 years of Chairman Mao’s Cultural Revolution (1966-1976). Some accounts of church closure and destruction, anti-Christian attacks, torture, and martyrdoms have been already published, though most of the government-sponsored atrocities against Catholics in China remain “too sensitive” to discuss in China. Gerolamo Fazzini’s, The Red Book of Chinese Martyrs (Ignatius Press, 2009), has exposed several attempts by the Chinese government to repress—or erase—Catholicism in China, but this work, too, serves only as an introduction to the sweeping violence of the Cultural Revolution. During a recent visit to Beijing, I returned to my favorite church there, Xishiku Church, 西什庫教堂, more famously known as North Church, 北堂. As I stood admiring the monumental façade, I noticed a groundskeeper giving particular attention to an area beside a nearby tree; it was as if he was attending to a sacred site. After I spent considerable effort to earn the man’s trust, he confided a stirring account of a Red Guard attack against an elderly priest on that very spot during the summer months of 1966. When a large crowd of teenage Red Guards, encouraged by Mao to confront and destroy the “Four Olds” (Old Customs, Old Culture, Old Habits, and Old Ideas), arrived at the church, an elderly Chinese priest met them near the church entrance. The priest was forced to kneel beside the church while his arms were contorted above his head in what was called the “airplane position”; in this painful state he was subjected to ridicule and commanded to denounce his religious belief. He refused. The Red Guards threatened to bury him alive if he did not apostatize. He still refused. The groundskeeper, a member of the North Church community, informed me that he was attending to the location where the old priest was buried alive by Chairman Mao’s radical Red Guards; events such as this were common during that era, and retelling them is still a risk. During the “10 year catastrophe,” as the Cultural Revolution is commonly called in China, Catholic churches were desecrated, destroyed, or seized by the government for secular use. During that time Beijing’s Catholic churches were all emptied and reused: North Church was used as a middle school; South Church was a processing factory; and West Church was a warehouse for Chinese herbs. While it is difficult to locate images of Red Guard attacks against Catholic churches, I have been able to acquire a few photographs taken during the most violent months of 1966. 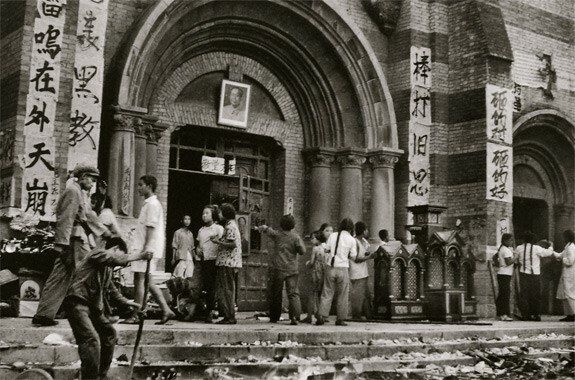 Two photographs taken in front of Beijing’s South Church show a characteristic Red Guard attack against a Catholic property. The church, which marks the original location of Matteo Ricci, SJ’s (1552-1610) chapel during the final years of the Ming dynasty (1368-1644), was emptied of all its religious objects (statues, art, relics, tabernacle, and so forth), which were gathered near the church façade and burned before a large crowd of radicals. In one photo we see a banner suspended from the church roof that reads, “Long live Chairman Mao!” (毛主席萬歲), while onlookers crowd around a rising flame. And in another image, Red Guards smile and laugh as they destroy statues of Jesus and Mary with hammers and clubs; the figure of Christ crucified lays headless among the broken statues. Another photograph taken in front of Tianjin’s Xikai Cathedral, 西開教堂, depicts images of Chairman Mao and anti-Catholic slogans pasted around the church’s front door. The tabernacle rests on the front steps as Red Guards burn and destroy sacred objects from the cathedral interior. More distressing than the destruction of churches during Mao’s Cultural Revolution were the arrests, beatings, and executions of Chinese Catholics. The story of Father Wang Shiwei, OFM (1910-1970) remains largely unknown outside China; he is among the countless Catholic martyrs who suffered cruelty and death while Chairman Mao orchestrated events from his Beijing residence. In an unpublished manuscript by Wang Jingshan, an elderly Catholic villager in central Shanxi, Father Wang’s suffering is outlined in bitter detail. In the 1960s, all the Catholic bishops, priests, sisters, and seminarians around Taiyuan were summoned to an assembly at the city’s cathedral; the meeting was convened under the typical Maoist slogan, “Eradicate Religion” (消滅宗教), and during one of the sessions Father Wang exhorted the Catholics to “resist cowardice” and remain faithful. He was later arrested by large groups of Red Guards. They were merciless. “His prison was popularly called the ‘prison of death,’” writes the author of Father Wang’s biography; his feet and hands were shackled in chains so that he was unable to stand erect, and another chain linked his body to a beam above his head so that he could not lie down to sleep. He was restrained in this fashion in his prison cell for several years. In January 1969, Father Wang Shiwei was sentenced to death for defying the government and for resisting “intellectual reform”; in short, he refused to deny his Catholic beliefs and support Communism. On February 15, 1970, Wang was beaten in his prison cell, and then taken to a public stage where he was shot and killed. In my next, and final, installment of “China’s Modern Martyrs: From Mao to Now,” I will trace the Church’s efforts to remain alive after Mao’s death. Many are surprised to learn that since the founding of the People’s Republic of China in 1949, the number of Chinese Catholics has grown by at least 10 million. This growth has occurred during an era of unrelenting persecution of Christian believers, both Catholic and Protestant. Chairman Mao’s expectation that China would “grow out of Christianity” was little more than wishful thinking; his attempts to eradicate the Church ironically resulted in its expansion. I shall turn to the post-Mao years in the next “Clark on China,” an era of growing freedom for Catholics, but also a time of continued harassment and anti-Christian discrimination. In 1900, a Vincentian priest named Father Wu prayed to the Virgin Mary, asking her to protect his community of Catholics at Donglü village from attacking Boxers. Traditional accounts assert that when the Boxers approached the village a “beautiful lady in white” appeared in the sky surrounded by a formation of lights. The Boxers shot their rifles at the emanation, but eventually fled in fear. The village was saved. In thanksgiving the priest commissioned the construction of a new shrine dedicated to Our Lady, and a painting of Mary wearing imperial robes (modeled, rather ironically, after an image of the Empress Dowager Cixi [1835-1908]) was to be displayed inside. During a 1925 synod held in Shanghai, the collected bishops decided to use the Donglü painting as the official image of “Our Lady of China,” and in 1932, Pope Pius XI (1867-1939) consecrated the village as an official Marian shrine for pilgrims. Devotion to Our Lady of Donglü, China sustained the faith of countless Catholics during the Maoist years of severe persecution, and after Mao’s death Chinese faithful restored the tradition of making annual processions to the Lady at Donglü, who had protected them through both the Boxer Uprising in 1900 and the Maoist era, from 1949 to 1976. One hundred thousand Catholics from the unofficial community (“underground Catholics”) formed a long processional line in May 1995, carrying banners and praying the Rosary as they approached Donglü village. On May 23, more than 30,000 Catholics reported a miraculous vision as the priest began to offer Mass at the shrine. The sun was seen spinning from right to left, while various shades of light emanated from different areas in the sky. Some claimed to have seen the Our Lady of China image in the sky, the Virgin holding her Divine Child. The apparitions lasted around 20 minutes, and afterward the bishop of Baoding approved the vision as verifiable. The following year, in 1996, the Chinese government was so exacerbated by the popularity of the Marian shrine at Donglü that it made illegal future pilgrimages to the village, and 5,000 troops were dispatched to the shrine to assure an end to the renewed Catholic devotion to this site. Accompanied by around 30 armored vehicles and military helicopters, the village was sealed off, the shrine was destroyed, and the local police confiscated all the statues and images of Mary. I have visited Chinese Catholics in several provinces and dioceses, and one of the recurring themes I hear from the Catholics I speak with after Mass is their sense of an antagonism between Mary and the current government. There were not many opportunities for pilgrimages to Marian shrines during the Maoist era; they were all closed. Now, however, even as churches are reopened and China’s Church continues to grow, the destruction of the Marian shrine at Donglü functions as a reminder that Catholic freedom is far from complete. When China’s bishops met in Shanghai in 1924, the pope’s apostolic delegate to China, Cardinal Celso Costantini (1878-1958), proposed that the synod fathers consecrate China to the Most Holy Virgin Mary. As Father Jeremy Clarke, SJ has describes this important event, “The consecration meant that the Church leaders were placing the needs, the hopes, and the prayers of their communities (and the whole of the Chinese people) at the feet of Mary in a special way, seeking her intercession and help.” When Bishop Gong Pinmei faced a crowd of young Catholics as the Maoist era began, he told his flock to turn to Mary and the Rosary. This, he said, was how they would win their battle to survive, and this is how they are winning this battle still. Quoted in China Missionary Bulletin, Vol. IV (V), No. 3 (March 1952): 442-443. Quoted in Msgr. Stephen M. DiGiovanni, Ignatius: The Life of Cardinal Kung Pin-Mei (Stamford, CT: Msgr. Stephen M. DiGiovanni, 2013), 34. Paul P. Mariani, Church Militant: Bishop Kung and Catholic Resistance in Communist Shanghai (Cambridge, MA: Harvard University Press, 2011), 40. “Guanyu Tianzhujiao Jidujiao wenti de zhishi,” 關於天主教基督教問題的知識 [Concerning the Problem of Catholic and Protestant Christians], Shanghai Municipal Archives 上海市檔案館, B22-2-1. Quoted in Mariani, 39. Jiefang ribao, 解放日報 [Liberation Daily], Shanghai, 12 October 1951. Jiefang ribao, 解放日報 [Liberation Daily], Shanghai, 13 October 1951. Quoted in China Missionary Bulletin, Vol. VII, No. 9 (November 1955): 821. John Casey, “Felon No. One,” in “. . . But Not Conquered,” Edited by Bernard T. Smyth (Westminster, MD: The Newman Press, 1958), 165. Jean Monsterleet, SJ, Martyrs in China, Transl. by Antonia Pakenham (Chicago: Henry Regnery, 1956), 61. Monsterleet, 16. For more on the martyrdom of Father Zhang Boda, see Jean Lefeuvre, SJ, Shanghaï: Les Enfente dans la Ville (Paris: Témoignage Chrétien, 1957), 92-99. A “draft manuscript” (初稿) of this booklet is retained in Yangquandao (Liuhecun) Village and is yet unpublished, as the nature of its narrative remains sensitive in Mainland China. See Wang Jingshan, 王靜山, Yu gaoge zhu : Wang (Leisi) Shiwei shengping xiaoji 獄高歌主：王（類思）世偉生平小記 [High Praise to God in Prison: A Small Record of the Whole Life of Wang (Leisi) Shiwei] (Liuhecun 六和村, Shanxi 山西, 2000). Lian Xi, Redeemed by Fire: The Rise of Popular Christianity in Modern China (New Haven: Yale University Press, 2010), 204. Vincent Goossaert and David A. Palmer, The Religious Question in Modern China (Chicago: University of Chicago Press, 2011), 167. Mao Zedong, speech given December 1939, “The Chinese Revolution and the Chinese Communist Party,” Selected Works of Mao Tse-tung, Vol. II (Beijing: Foreign Languages Press, 1965), 312. Photographs of Brother Zhou’s crippled arms can be seen in the middle signature of his book. Brother Peter Zhou Bangjiu, OSB, Dawn Breaks in the East: One Spiritual Warrior’s Thirty-three Year Struggle in Defense of the Church (Maria Stein, OH: Serenity, 1992). Jeremy Clarke, SJ, “Our Lady of China: Marian Devotions and the Jesuits,” Studies in the Spirituality of Jesuits, 43/1 (Autumn 2009): 38-39.